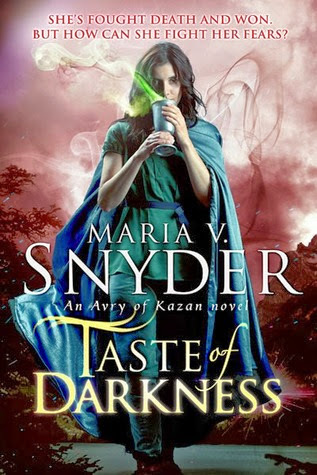 Taste of Darkness is the third and final installment of the Avry of Kazan/ Healer series. As a final book in a series it does not disappoint. This series has become a favorite of mine, from the thrilling adventure to the wide cast of some of the most fabulous and lovable characters, a swooning romance and a world to get lost in. Keeping with the tone of the last two books this one keeps the pace of adventure and romance moving swiftly. From battle planning in the mines, a breakout in a convent, battles with the undead, and coming face to face with cannibals. This story is full of shocking revelations and captivating twists. Avry and Kerrick will always be one of my most favorite couples, everything about their relationship is incredibly refreshing, their love and respect for each other is really quite new in YA, neither are overly dependent nor smothering, they know that their are things going on that are bigger than the two of them and they realize that though they might not like it they will put whatevers necessary before them selves. Avry is a fantastic female protagonist, she's incredibly selfless, brave, intelligent, kind and witty. Like a breath of fresh Air she is strong willed and quick witted. I have really enjoyed seeing Avry grow over this series, no longer is she on the run hiding healing the odd child then having to run, now she is a highly respected healer. No longer on her own she has a group of loving friends that are a lot more like family and Kerrick, which is all more than she had ever wished for. New characters and old light up this story, some you wish you could just hug and take home with you and some you just love to hate! Seeing how each character has grown and developed over the process of this series is really a joy in it's self and makes you feel like part of the crew! I have really enjoyed this series and recommend highly. Every aspect of this series is played perfectly, though this book does start of with a slight recap i would recommend that if you're going to read this series do so within a close time scale, i read all three books within a week. Obviously you don't have to read them within a week but i would say you should read them close together because with the wide range of characters and with such a complex plot and world it's best to keep it all fresh in your mind so you can really appreciate every part within out forgetting any key points from the previous books. The Acvy of Kazan series gave me a week filled with enjoyment, adventure, suspense and love. If your looking for a new series of fantasy and romance i suggest you pick this one up, you wont regret it. Promise. "Oh no," Quain said. "I recognize that look. It means trouble"
"It means she has a plan," Loren corrected.